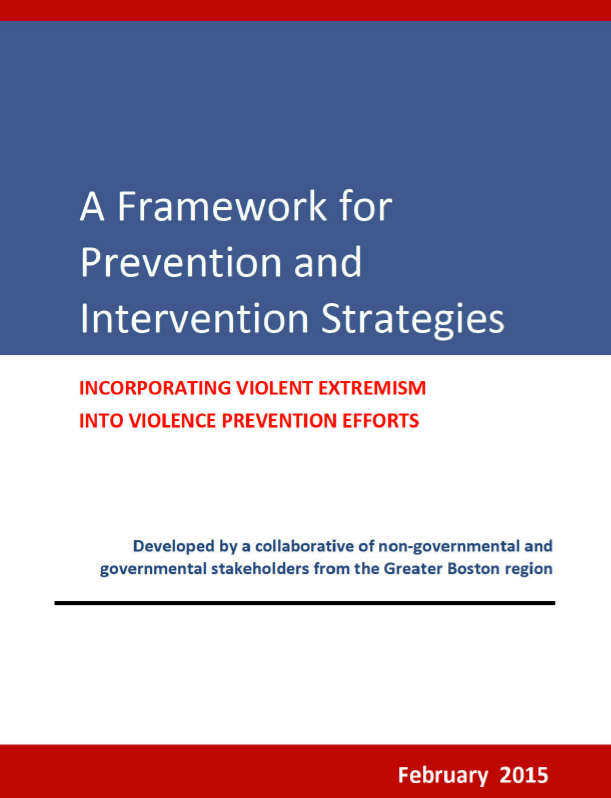 The following guide for countering violent extremism was released by the U.S. Attorney’s Office for the District of Massachusetts in February 2015. The locally-driven framework has been developed by a collaborative of non-governmental, governmental and academic stakeholders from the Greater Boston region. (See Appendix A) Contributions were made through in-person meetings, phone conversations, emails and other written correspondence. Working Group meetings were held on a regular basis to work through issues and craft an approach that can be customized based on the local needs. Violent extremists are individuals who support or commit ideologically-motivated violence to further personal, political or social objectives, sometimes without direction from or influence by a foreign actor. There are a number of violent extremist ideologies that are based in politics, religion or 1The Collaborative has included numerous City of Boston personnel who have provided guidance and expertise on best practices. The City of Boston has implemented many of the solutions contained in the framework, some through Boston’s National Forum on Youth Violence Prevention and Boston’s Defending Childhood Initiative. Reference: Federal Bureau of Investigation, Countering Violent Extremism Office, Washington, D.C. economics. The framework developed by the Collaborative in the Greater Boston region does not focus on any one form of violent extremism. Through the initiative, the Collaborative has been working to clarify the meaning of Countering Violent Extremism and to identify language and initiatives that promote resilience, respect and partnership. Both governmental and nongovernmental collaborators have demonstrated a commitment to work through an inclusive process that will not polarize communities. PROBLEM ONE: Some young people may be at greater risk of feeling isolated and alienated, making them more vulnerable to recruitment by violent extremists. PROBLEM TWO: Providing services to individuals before mobilization toward violent extremism is challenging when there is a lack of understanding regarding violent extremism and limited intervention programs. PROBLEM THREE: Social media and other media platforms are being used to recruit individuals to join extremist groups and to encourage individuals to engage in violence. PROBLEM FOUR: U.S. policy and events around the globe can frustrate, anger and, at times, influence some to think that there is no effective alternative other than to express grievances or solidarity through the use of violence. PROBLEM FIVE: Distrust between government and non-government hinders collaboration and effective decision making and problem solving. PROBLEM SIX: Lack of knowledge in mainstream society regarding religions, cultures and thought systems which are unfamiliar or are maligned in the media contributes to poor perceptions that fuel and mutually reinforce fear and estrangement. PROBLEM SEVEN: Individuals convicted of hate crimes and terrorism offenses require specialized support and services before and after release from prison.